Former champion Rory McIlroy hopes a second victory in the BMW PGA Championship can spark a repeat of the best season of his career. McIlroy admits he has a “weird relationship” with Wentworth, where he won one of the European Tour’s flagship events in the same week he called off his wedding to tennis star Caroline Wozniacki, but has also missed the cut four times in eight appearances. But the 29-year-old’s win in 2014 was followed by consecutive victories in the Open Championship, WGC-Bridgestone Invitational and US PGA, form he would love to reproduce following an inconsistent season to date. “I guess all you need is that spark or that catalyst,” McIlroy said. “I felt like my game was trending in the right direction in 2014, but didn’t quite have the win. On that Sunday I was seven shots behind going into the last day. I didn’t expect to win. I just wanted to go out and play a good final round. McIlroy’s 2018 campaign has hardly been a disaster thanks to an impressive victory in the Arnold Palmer Invitational and three other top-five finishes, but he has also missed three cuts and failed to complete the career grand slam after a disappointing final round in the Masters. “The win at Bay Hill was great,” McIlroy added. “I think playing my way into the final group at Augusta was fantastic, as well, so they were real steps forward compared to, say, the last 18 months. 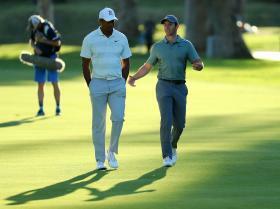 Scheduling issues meant McIlroy did not play at Wentworth in 2016 and injury ruled him out last year, meaning he has yet to compete over a course which underwent major changes after Ryder Cup team-mate Chris Wood’s victory two years ago. “I think they’ve made some great changes and it’s shaping up to be a good week,” added McIlroy, who worked on his swing with coach Michael Bannon in Florida last week. “It’s a course where if you’re not quite on, you can get frustrated easily and sort of let it go from there. If you’re playing well and you have the ball under control, it feels quite easy because you can hit fairways and hit greens and give yourself chances. “I think it just magnifies either side of your golf game; when you’re playing well you can do great, and when you’re playing badly it really frustrates you and it’s hard to get out of that.